For the past two weeks, David Villa and Cesc Fabregas has been dominating FC Barcelona news columns throughout the world. There is no clarity still with the pursuit of the ex-Barca star, but there looks like more trouble emerging for Barca from within the house. FC Barcelona management and fans has always been proud about their youth academy and the quality that churns out every season. Now it looks like that abundance of quality is going to give us a new headache this summer. Almost five players from FC Barcelona Athletic is at the end of their contract. Jonathan dos Santos, Thiago Alcantara, Victor Vasquez, Gai Assulin and Marc Bartra are the youngsters whose future needs to be resolved quickly. The biggest problem for negotiating a deal is the lack of first team action at Barca. Jonathan dos Santos and Thiago saw some first team actions this season under Guardiola, but with Barca going for a buying spree they may see very limited action next season. FC Barcelona has revealed the Official Jersey for 2010-11 season today coinciding with the presentation of David Villa. The traditional home jersey have the thicker Blaugrana stripes compared to last season. The other change is the introduction of Red shorts compared to the last season's blue ones. Inside the collar the words "Tots units fem força" (Together we are strong) are taken from the club hymn and on the left sleeve the slogan "Més que un club" (More than a club) is embroidered. . There is a drastic change in the new Barca away jersey. The away jersey is pre-dominantly green with the Blaugrana colours across the chest. 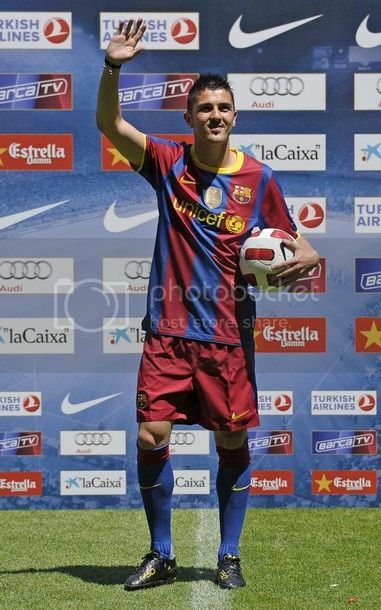 I seriously like the away green colours but the Blaugrana stripe kills the look. 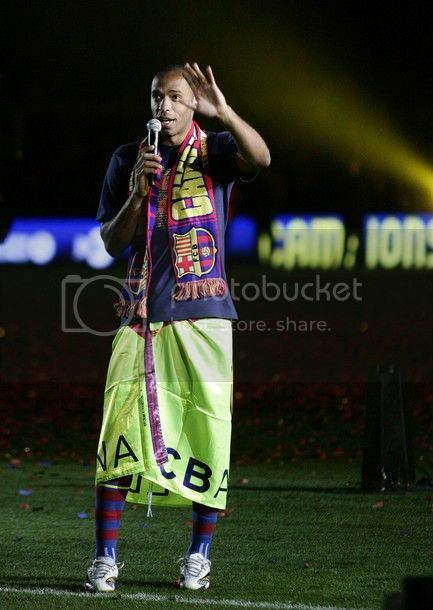 The last time we wore the Red shorts was in the season 2005-06 which was a Champions League winnng season. From the official site - "The new FC Barcelona shirts are unique in the same way that the shirts worn last term were also in the fact that they are manufactured from recycled plastic bottles". Ain't it quite strange? When I wrote the match report for the Valladoid vs Barca match, many here thought that ideally would be my last post for the next two months. With my experience with previous transfer season, I knew that wasn't the case. The truth simply is that the real entertainment off the pitch starts the moment the transfer window opens or in other words when the season ends. Usually in a World Cup year, the transfer market usually heats up after the Showpiece event. But this time it has become hyper active much earlier. FC Barcelona should be blamed for setting the fire with their early pursuit of David Villa and Cesc Fabregas. They didn't wait for Real Madrid to inflate the market and started their business from the very next day after their La Liga defense. Already huge war of words are going between Arsenal and Barca fans all over the web for their pursuit of Cesc Fabregas. As I wrote in my earlier post, At 80 Million, Fabregas Deal Better Be Dead, the entire Cesc Fabregas story has shot up after Spanish Journo, Guillem Balague has suddenly reported about Fabregas expressing his interest to return home. The entire Spanish media based in Barcelona and the likes of Sid Lowe, Martni Samuel from England helped in raising the story to enormous proportion. The truth still remain that all these are mere specualtions and nothing has been clarified by any parties. Arsenal fans are rightly feeling being targetted not only by Spanish Journalist but also those from their own countries. At this moment nobody can say anything about this one and we may have to wait and watch. With reports emerging from London about Arsenal slapping a price 80 Million pound, the Cesc Fabregas transfer saga has truly heaten up. Suddenly the great enthusiasm that surrounded the Barca Management regarding Fabregas has made way to caution. The recent comments made by sporting director, Txiki Begiristain is a testimony of the sudden realisation that this one is not going to be easy. Begiristain recently said "What counts here is Arsenal and what their decision is, because Cesc is a very important player for them. It is great news that he wants to come. Sometimes what players want does not happen ,they have contracts in force. 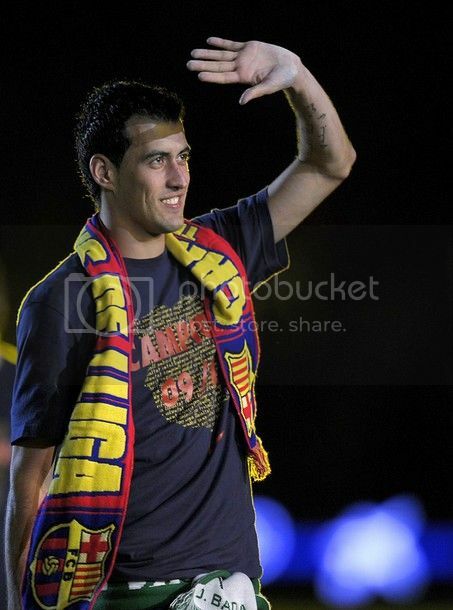 I think that at some stage Cesc will come to FC Barcelona. I don't know when but I have the feeling that he is a Barcelona player and he would love to play here. But we have to respect Arsenal and the contract he has there." Now that's a sudden change in attitude as it was reported that the Barcelona Hierarchy recently gave a "Now or Never" ultimatum to Cesc Fabregas. Now there is a realisation that Arsenal will do whatever needed to hold on to their captain and it's essential not to irritate the Premier League club. 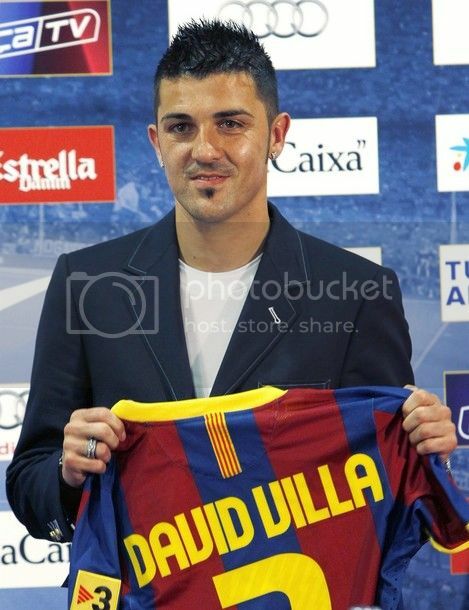 FC Barcelona has completed their first signing of the summer in the form of David Villa from Valencia. THe official FC Barcelona website has broken the story just moments ago. Barca was widely expected to copmplete the signing by Friday. FC Barcelona will pay Valencia 40 million Euros for the prolific Spanish striker. Villa is expected to reach Barcelona on Thursday evening and will undergo mandatory medical tests on Friday morning. We all know these are mere formalities. Villa is expected to sign the deal around Friday afternoon followed by the official presentation to the Camp Nou public. 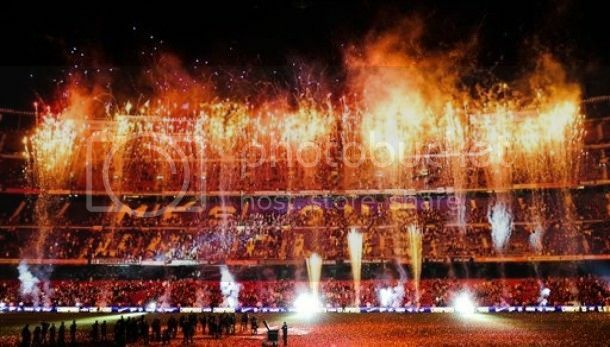 Camp Nou will be open for public during the presentation and trust me we may see scenes similiar to Ibrahimovic signing. Villa will sign a four year deal with an option for a further year. It is not yet known how much Villa will take home at Barca. There is no particular order in these. I just picked a bunch of last season's wonderful goals for a recap of the wonderful season we had. It's a huge injustice that the record books will have Messi as the goal scorer and Pedro as the player who provided the assist. Nonsense, it was Xavi singlehandedly who created this one. After seeing this you feel pity for all other midfielders in the world. If rumours emerging from Spain and England are to be believed, FC Barcelona is pretty close to completing the signing of David Villa and Cesc Fabregas. Joan Laporta has made it a priority to complete the signing of these two Spanish internationals before the end of his tenure. Actually Cesc Fabregas has expressed that he would like to see his future resolved before the World Cup in South Africa. If Barcelona based daily Sport is to be believed, then we most probably will sign David Villa by the end of the week. That may be a bit of exaggeration but Laporta himself have said that the negotiations with Valencia over David Villa is in an advanced stage. Mean while David Villa has learnt from last season's mistakes and is not revealing anything about his desire. He has stated that he will make a move away from Valencia only if the financial situation forces the club to sell him. Victor Valdes - 8.5 - Victor Valdes won his third Zamora Trophy by a whooping 10 goal margin. A closer look and you will say that this won was the most deserving of all his trophies. Even in last season, he was his usual self, producing some telling saves, but at the same time producing some disastrous mistakes. This season he was a revelation. There were very few mistakes he made and was called upon on action in more than the usual occasion. He proved to everyone that he is the best when it comes to one on one situation and with every passing year he is improving by leaps and bounds. He should consider himself really unlucky if he is not on the plane to South Africa. Dani Alves - 7 - Another consistent year, but nowehere near his performance of last season. He had to live up with a patch where his form was really below par. Very lively in most of the matches and I firmly believe he is missing playing with Messi on the right. But overall a very decent season, struggled against quality opponents. 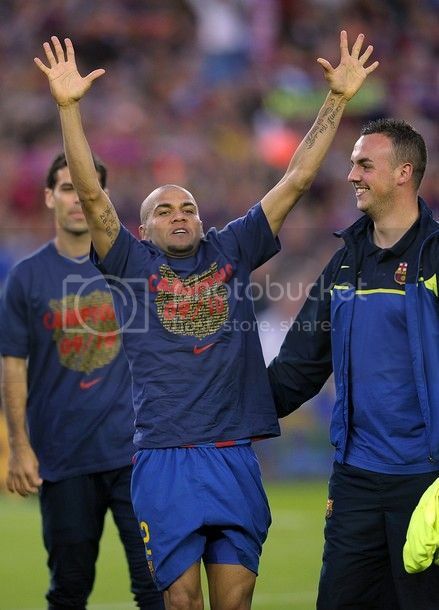 With Alves we may have to live up with the occasional low profile performances. Gerard Piqué - 8.5 - Still don't understand how a manager like Ferguson could let him go. Good for us though. After joining his childhood club back, he has been stunning. Constistent performance throughout the match and the advantage with him is that he present a good option in attacking corners. 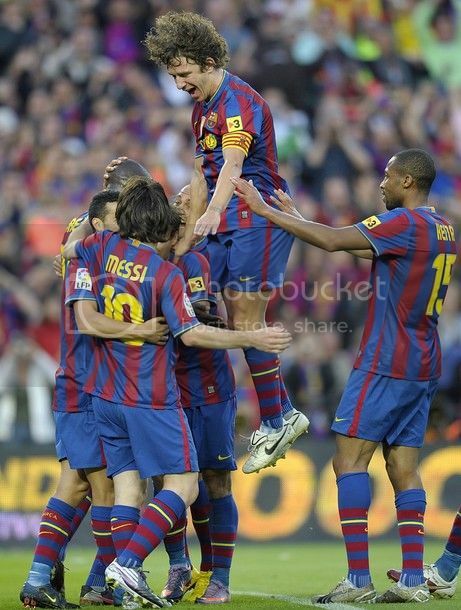 There were some excellent performances but the best has to be the 1-0 win against Inter Milan at Camp Nou. Rafael Márquez - 6 - Way past his prime and many believe he to be leaving soon. But I expect him to stay here for one more season. He is quite a utility player but his lack of speed nowadays is killing him. Still not a bad cover for our top three defenders. 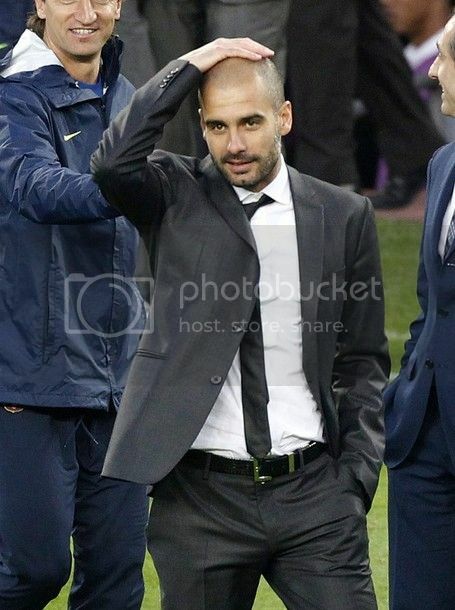 Pep Guardiola did show confidence in him in many matches, but he was responsible form a number of goals we conceded. 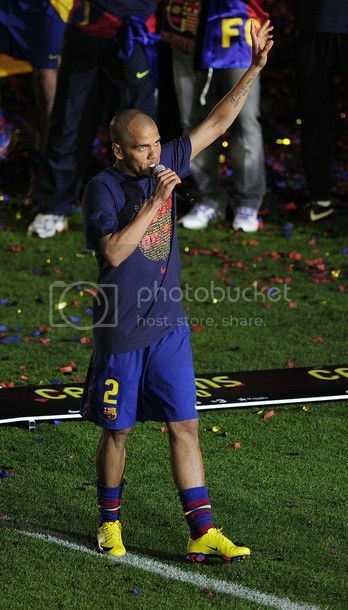 In one of the most nail-biting finish to the season, FC Barcelona were crowned La Liga Champions 2009-10 season after beating Real Valladoid 4-0. Meanwhile Real Madrid, who gave Barca a tough fight till the end could only manage an away draw against Malaga. An own goal from Prieto, followed by a second from Pedro and a brace from Lionel Messi secured Barca their second consecutive League title. Lionel Messi with his two goals equalised the record held by Ronaldo, set in the 1996/97 season. With Xavi suspended everyone expected Iniesta to start from the begining, but Guardiola rightly decided to not to start with him after the injury lay off. 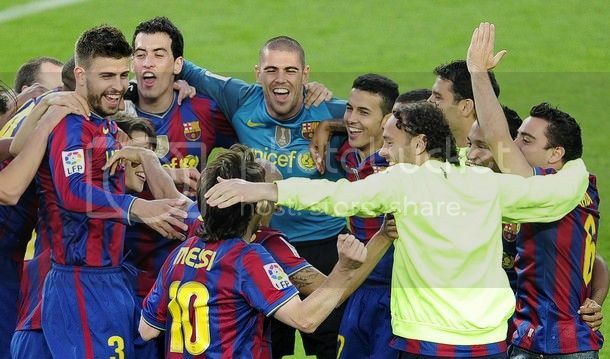 So we had our traditional defensive line-up with Alves, Pique, Puyol and Abidal lined up infront of Valdes. The midfield had Busquets, Keita and Toure. The forward line-up once again saw Ibrahimoivc missing, resluting in Bojana and Pedro pairing Messi. Why Bojan Krkic has been so good lately? How quick things change in the world of football? Last December every Barca fan were complaining about how disappointed were they with the performance of the little Bojan Krkic; now they can't stop praising him. Indeed Bojan Krkic has been in a tremendous goal scoring streak and have impressed everyone including his manager. Guardiola suddenly started to believe in him, which explains why he was preferred in place of Ibrahimovic in two of the most crucial away games against Villareal and Sevilla. Every Barca fan is swearing by his name and would like to see him replace the 70 million Ibrahimovic in the last game of the season. 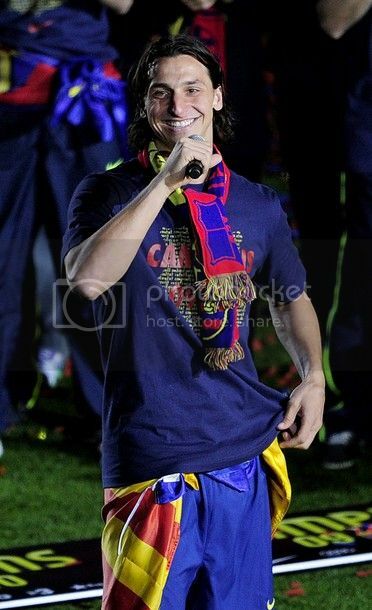 But it was not so bright and shiny for Bojan at Barca this season. 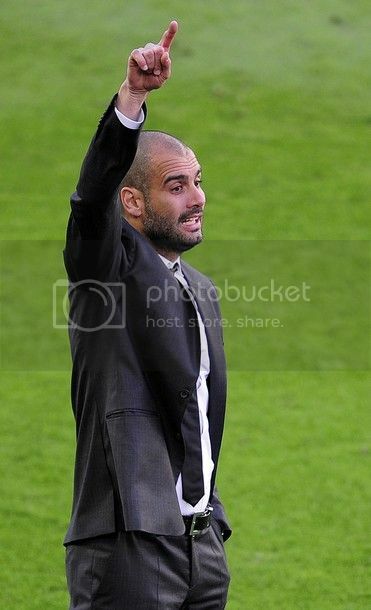 Till recently he was struggling to find any meaningful playing time under Guardiola. Forget having a lack of confidence in the young striker, Guardiola's approach earlier gave a picture of having o belief in his talent. He was overlooked for Pedro on numerous occasion. Even when Ibrahimovic was struggling Guardiola never called upon Bojan, not even as a substitute. The only piece of action he was seeing was the Copa del Rey actionl; but with Barca going down to Sevilla he was virtually warming the bench. I earlier wrote a piece arguing why Bojan should move out of Barca for the good. A host of footballing nations has announced their initial World Cup squad for this year's footballing extravaganza in South Africa. The latest to announce was the Argentinian coach Diego Maradona. As expected Maradona has surprised many by omiting a host of this season's best performing players. You may be excused, if you believe that Maradona has gone crazy after over-looking the Inter Milan duo of Zanetti and Cambiasso for the initial 30 man squad. He now has to trim it to the 23 man final squad list. When you see the names of Fabricio Coloccini and Heinze, a player seriously in the end of his career, you will be forced to question the logic of omitting two of the most sensationally performing defensive midfielders in world football. Another high profile name who is missing is FC Barcelona's Gabriel Milito. But it should be upto the lack of playing time, but seeing how Martin Demichelis have performed in recent Bayern Munich's matches in Europe, I would have seriously preferred Milito. Another name which is missing is Real Madrid midfielder, Fernando Gago. He was never expected to make into the first eleven, but was widely expected to make the trip to South Africa. Maradona looks like have preferred players who play in Argentina rather than the usual trend of picking Europe based players. This could backfire spectacularly as the quality experience could be handy in the World Cups. For the record Lionel Messi has been named in the 30 men squad and let's hope Maradona won't cut his name out. Crucial Updates : Jonathan Dos Santos makes into 26 men Mexican Initial Squad along with his brother Giovanni. Barca beat Sevilla in a nervy encounter. It may not be arrogance to say that we have one hand firmly placed on the La Liga title following our 3-2 victory against Sevilla at the Sanchez Pizjuan stadium. At the end of penultimate week of La Liga, Barca stands one point clear of their bitter rival Real Madrid. Coming to the last four matches of the league, we had two risky away encounters against both Villareal and Sevilla. Now with those test passed, only Real Valladoid stands between FC Barcelona and the La Liga title. In the preview of this match - Barca vs Sevilla Preview, I have written about the necessity of our players being at the best. And indeed they were at their best for the first 65 minutes notching up three goals and starving Sevilla off any meaningful chance. Then in the spate of three minutes, we decided to make the encounter more interesting - conceding two goals in three minutes and almost conceding the equaliser in the end moments. But in the end the team prevailed the momentary lapse of concentration and emerged deserving winners. As expected Bojan started the match instead of Ibrahimovic. He formed the attacking trio along with Pedro and Messi. The midfield consisted of Keita, Busquets and Xavi. The defense had the expected look with Alves, Pique, Puyol and Maxwell. After the year long drama, the La Liga season is coming to an end with only two games remaining. But we may not have to wait for another week to know who will emerge the winner. 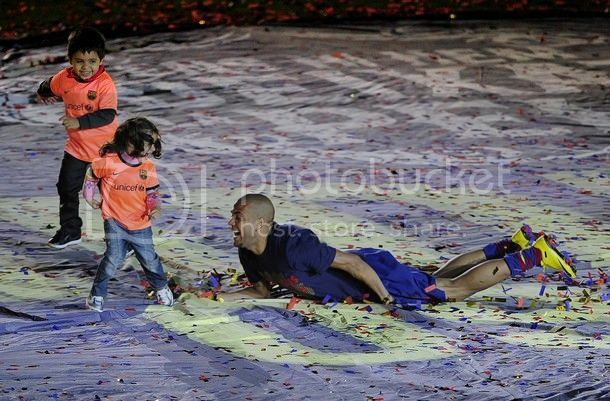 With Barca visiting Sevilla, this has to be the most pivotal moment in this La Liga season. A win at Sanchez Pizjuan stadium will more or less guarantee us the title, but anything other than a win will see Real Madrid running away with the title. Simply put, the La Liga title is Ours to lose. Usually a visit to Sevilla evokes mixed emotion. Sevilla has one of the best home records in the League and will be real tough customer to negotiate. Our last visit to Sevilla was the 1-0 victory in Copa del Rey, but that wasn't good enough for us. Last season a Lionel Messi inspired Barca have beaten Sevilla 3-0 in the corresponding fixture. Can't believe I missed two of the most entertaining match in this season's La Liga chase. With Real Madrid on their tail, FC Barcelona has registered consecutive league victories against Villareal and Tenerife. 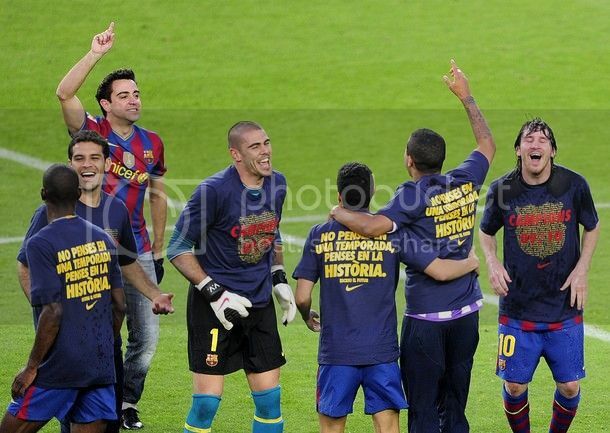 The margin of both the victories are the same with Barca managing to find the net on four occasion in each match. It was quite a surprise to see Ibrahimovic missing from the line-up against Villareal, especially with the David Villa rumours going strong. 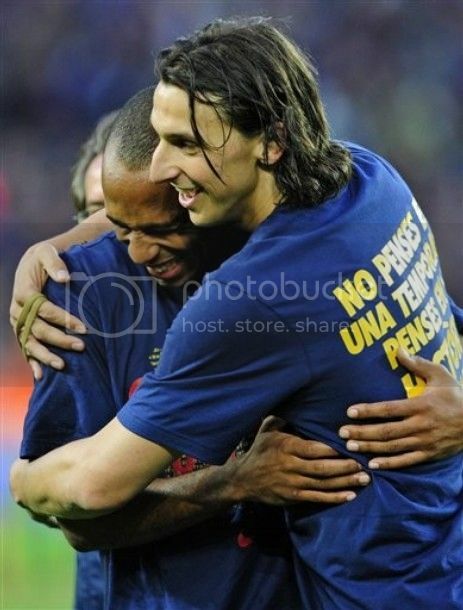 There were some suggestions which pointed that may be Guardiola has started to lose confidence in Ibrahimovic. But for now Ibra looks firmly in the plans of Guardiola and that should be the reason why he started with him against Tenerife. 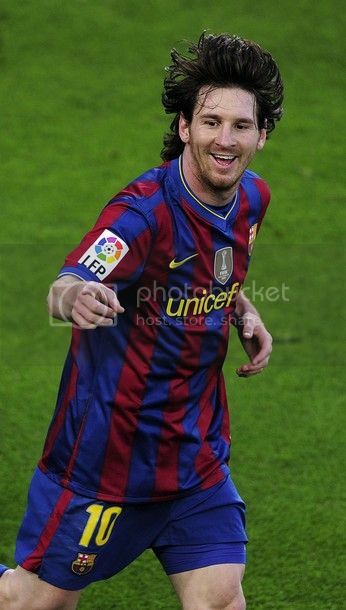 After the disappointing performance against Inter Milan it was good to see Messi back on the score sheet. He has scored four goals in the last two matches and now leads the La Liga Pichichi with 31 goals, six more than Real Madrid's Higuain.